Seattle City Council Member Mike O’Brien wants to make it easier for homeowners to build backyard cottages and basement apartments. In the midst of a housing affordability crisis spurred on, in part, by a greater demand for housing than available supply, using excess basement and yard space to create new homes makes sense. One of the priority recommendations from the city’s 2015 Housing Affordability and Livability Agenda was reduction of regulatory barriers for building attached and detached accessory dwelling units (ADUs and DADUs). Last year, O’Brien took up that mantle with a bill that would reduce the minimum lot size required to build a DADU, allow properties to have both an ADU and DADU instead of one or the other, and remove off-street parking requirements. Homeowners balked. Led by members of the posh Queen Anne neighborhood’s community council, a group of residents filed an appeal to block the legislation. They argued the city had not done its due diligence with an environmental impact statement (EIS) to determine the positive and negative effects of the code changes. In December 2016, a city hearing examiner sided with the residents, ruling that the city had to complete the more than yearlong EIS process before implementing the changes. In early October, as part of the EIS process, the city started soliciting public input on two paths forward. The first: Leave regulations as is. Single-family homeowners who live onsite will be able to build either an ADU or a DADU if they have at least a 4,000-foot lot and an off-street parking space, among other requirements. The second option: Incorporate all the proposed changes from O’Brien’s legislation with the added changes of allowing 12 unrelated people to live on the property (up from the current eight), and allowing ADUs and DADUs on properties that are not owner-occupied. A new group of urbanists, architects and pro-cottage homeowners is lobbying the city to be even bolder than what’s in that second approach. Calling themselves More Options for Accessory Residences (MOAR), the group has put out a list of 10 additional changes the city should make to boost accessory unit production. Seattle has allowed attached ADUs since 1994 and detached ADUs since 2009. From 1995 to 2016, only 682 ADUs were built. There were 292 DADUs built since 2009. According to the Office of Planning and Community Development (OPCD), there are about 75,000 properties in Seattle eligible to build DADUs under current regulations (82,000 would be eligible under alternative two’s smaller lot size requirements). Accessory units are not “capital A affordable housing” says Hutchins. A 2015 OPCD report says they typically serve people earning 80 to 120 percent of area median income. But, given the city’s goal of building 50,000 units of new housing by 2025 in order to meet the growing demand, ADUs and DADUs could be part of the solution. Regulations clearly play some role in the meager number of ADUs and DADUs being built. Portland, Oregon, and Vancouver, Canada, both recently reduced regulations for accessory unit construction and have seen massive increases in the number of units being built. 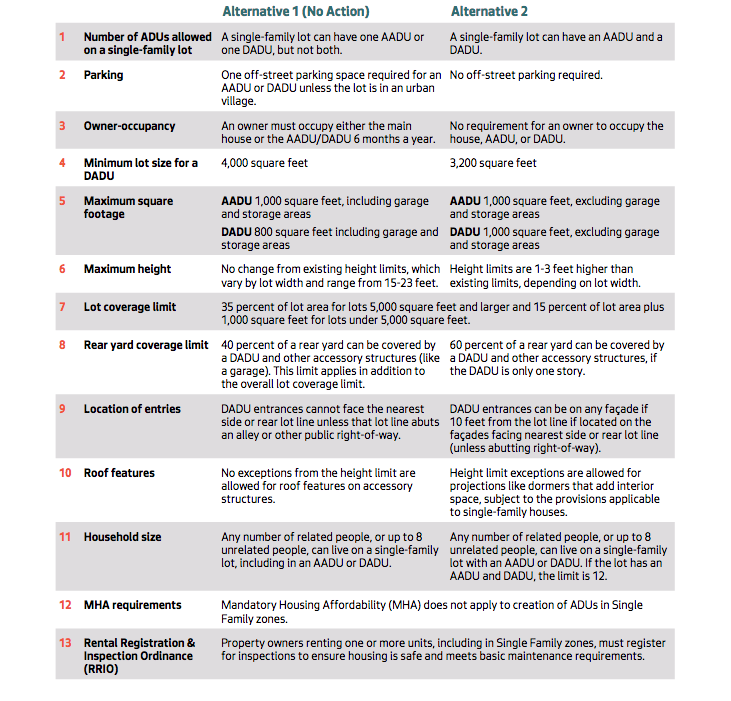 Vancouver removed requirements for off-street parking and owner occupancy, and relaxed rules about DADU height, width and placement in the yard. Portland made similar changes. Vancouver saw about 1,000 ADU/DADUs go up in 2016. Portland permitted 615 new ADU/DADUs last year. Other practical suggestions include allowing dual ownership of a property (essentially making it easier to subdivide a single-family lot so someone could own the backyard cottage separately), allowing separate utility metering, and creating a path for would-be DADU builders to qualify for small loans from the Office of Housing. If changes do come, it won’t be for a while. The city is aiming to release its final EIS in summer 2018 at which point the City Council could once again take up legislation.